For such a narrow strip of land, Kerala manages to pack in a wonderful cultural and ecological diversity that really should be experienced. Four hours of driving can take you from a sandy beach to the top of the ghats: during that journey you will pass rice paddies, back water canals, plantations of rubber trees, cocoa and spices, precipitous ravines and then the tea gardens and cardamom plantations until you climb through tropical forest to the peak. 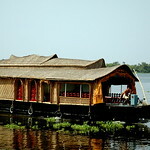 Happily you can see it all and enjoy an adventure into the cultural and social heritage of Kerala in a short time. We know that a lot of visitors are enthusiastic to see the diversity of Kerala, so we have prepared a range of sample tours that hopefully will whet your appetite to see our state. As always we work to different requirements and budgets, so you don't need to find the exact match here... just something that tickles your fancy and we can create a bespoke Kerala tour just for you!